May dual-wield any two axes. In Serin's primitive days when the world was more barren and empty, wild bulls charged across fields and found their way deep into the icy tundra. The herd eventually settled in the barren highlands. After centuries the warlord Immortal Diocletian transformed these beasts into humanoids capable of making homes and tools to protect themselves from the cold weather. The challenge of surviving in the barren highlands gave all the conditions for the need to cultivate a territorial race of man-beasts. Half-human, the rest purebred bull, these minotaurs built themselves a fortress of ice in the wastelands, and named it after their King. Present day Mahn-tor remains as fortified as it began, undefeated in battle with the armies of other races. Over time minotaurs have developed their own crafts and abilities, mastering to perfection the art of fighting with axes. They are also adept at charging, a talent passed down from their ancestors. Foul tempered minotaurs are renown most of all for selfish fits of anger when crossed. Their uncivilized stock that began far from towns and combined with their reactionary mindset is what makes all minotaurs truly chaotic. In the multitude of races that have made a dominant mark upon Serin, minotaurs remain a worthy adversary to all, their behaviour and bad temper as unpredictable as it is dangerous. Though their tempers and actions may seem unpredictable, minotaurs are guided by their god Diocletian and if there is one thing Serin can be certain of - it is that minotaurs seek glory through death. 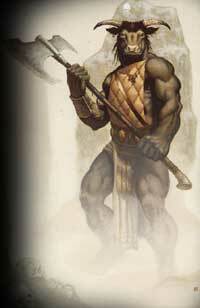 Some of the more extreme minotaurs have even adoped Resatimm as their deity. A minotaur's primary want is to meet their maker after a grand rampage and a befitting slaughter to numerous hands.